LRBRA Members Meeting & Tiny House Tour! 5-7:30 - Tour the Shop, Check out the newly designed TINY HOUSE Build & Meet the students.Enjoy pizza. Guest speakers to talk with the group. Interactive meeting. Members from other HBA's welcome! Great Meeting for Builders to learn the Do's & Don'ts on Wood Floors. TAKE CONTROL OF WOOD FLOORS! 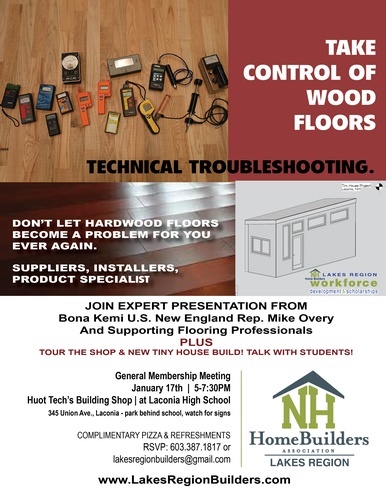 Expert Panel of speakers including Bona, Seacoast Floors, Bartlett Flooring, Olde Tyme Craftsman, Pederson Wood Flooring and Ponders Hollow & Custom Flooring walk through common questions. Learn about moisture content, calculating EMC, products and maintenance!